That is the best way for a streetfood snack! Sandwich with pork ( Porchetta sandwich recipe) ? Whatever may I say the best way to consume the porchetta of Ariccia is in a “sandwich with roast pork” richly padded. The recommended amount for a sandwich made with a classic “ciriola” Roman, or “rosette! Classic bread much like the Italians, and about 120-150 grams of product, perhaps with inside a piece of” crust ” crispy and goldened by the coocking process. The tradition of the “Castelli romani” home of “Fraschette” and porchetta want the sandwich with roast pork is prepared with homemade bread, ( Pane casareccio) the good one who is preparing to Lariano a nearby city, or Genzano the city of “Infiorata” or a wood stove among the few who have remained in circulation . 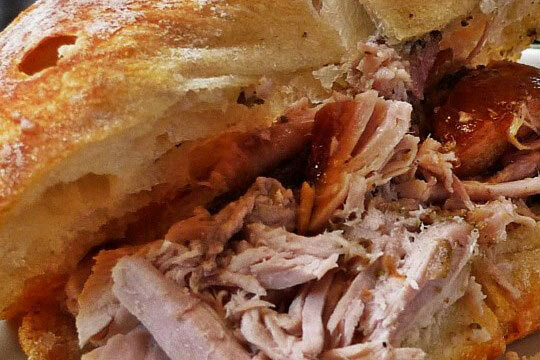 A sandwich with roast pork and hot homemade bread is the maximum streetfood at the Castelli Romani area but also a great healthy snack and nutritious. For those who had not tasted, the other a chance to taste the pork in a bun, is to get local pizza castle, heated with a plate for toas, and put into the delicious dish. The flavor of hot pizza with the crust will exalt you. Sandwich with pork: recipe for white pizza also.